Fits 1953–77 Fords with drum brakes. 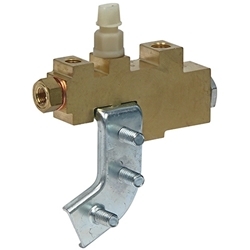 This is a drum brake distribution valve for dual-reservoir master cylinder and may not be an exact replacement. May require bending or replacement of brake lines. NOTE: This valve will work on 1953–77 Fords, but the brake pressure differential warning lamp switch is a dual-prong type for 1968–77 Fords.